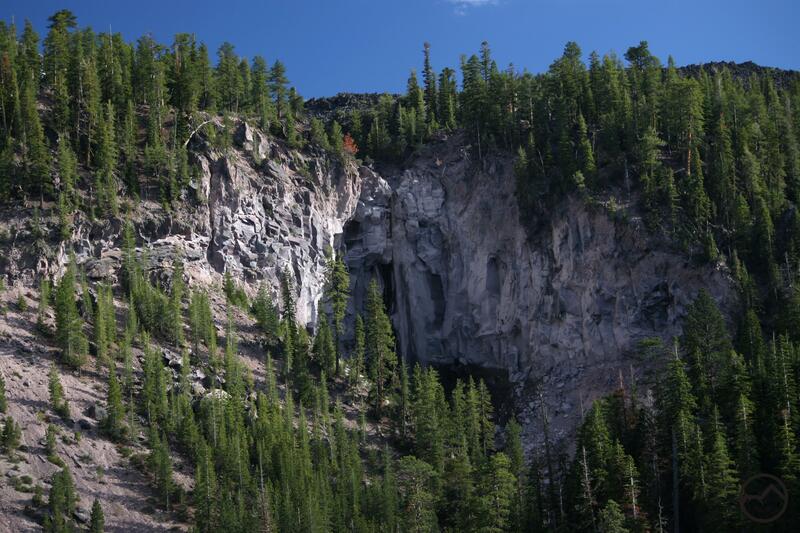 As noted here, Whitney Falls is one of the prettier waterfalls on Mount Shasta. Its feathery plunge into a narrow grotto is as graceful as it is striking. The 200 foot waterfall seems particularly out of place set against the black, jagged flows of lava and loose volcanic ash that surround it. Though some of the other waterfalls on Mount Shasta rank higher in beauty and power, Whitney Falls remains the most heralded waterfall on Mount Shasta. At a minimum, this has been case in guide books for nearly three decades and possibly much longer than that. 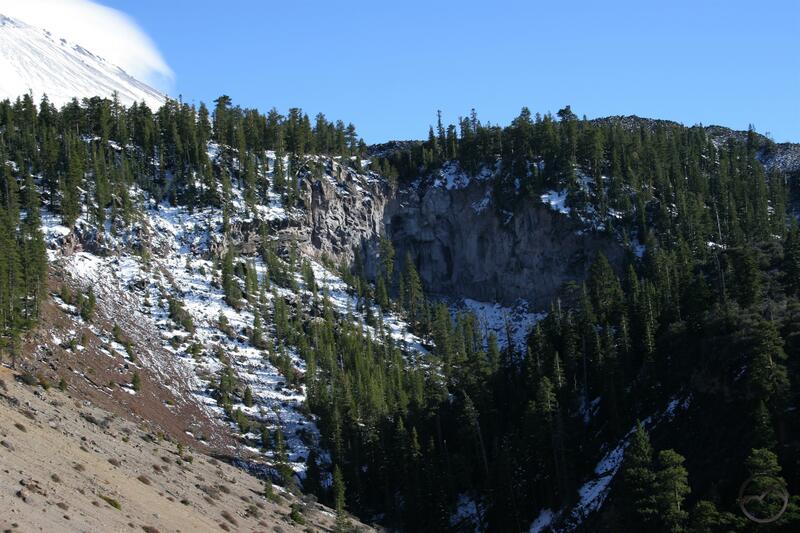 This is probably the case because the waterfall is at the end of the most easily accessed Mount Shasta trail that is not on the Everitt Memorial Highway. The dirt road to the trailhead is fairly short (about 4 miles) and in reasonable condition (though it is beginning to degrade considerably). The trail to the falls is also one of the easier routes on the mountain, without considerable elevation gain or length. Unfortunately the trail has been officially condemned by the Forest Service as a result of damage it sustained from a glacial outburst in 1997. While it is easily hiked, like the road to the trailhead, the path is in disrepair and gets worse each year. Consequently and paradoxically, the Whitney Falls experience is both blessed with relatively quick access but fraught with increasingly poor access conditions. A frustratingly dry Whitney Falls in late May. The biggest challenge confronted by those who seek after Whitney Falls is not related to access. The biggest obstacle to seeing the falls is the falls themselves. More specifically, the issue is the flow going over the waterfall. It is possible for someone to make the drive to the trailhead, hike the trail to the falls’ vista point and find nothing going over the cliff. It is an incredibly frustrating experience to make the journey to the falls only to find them dry. Given the degrading nature of the trail, the hot, lower elevation of the trail and the lack of views of Mount Shasta from the current route (there used to be great views of Mount Shasta but the route that included them is getting increasingly overgrown and the new, hiker-created use trail bypasses this section of the trail), this is not the best trail for hiking on Mount Shasta if the falls are dry. 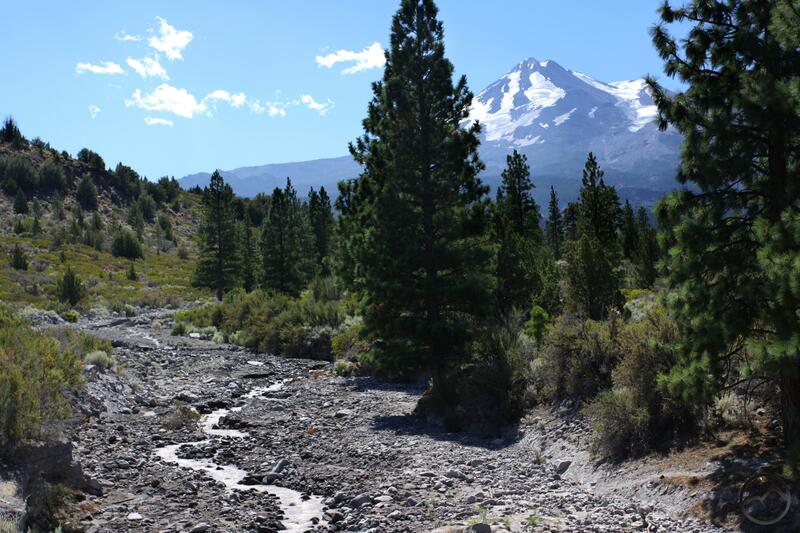 Mount Shasta looks down on Whitney Creek, near Hwy. 97. Adding further aggravation to the other challenges presented by the Whitney Falls Trail, one prominent guidebook suggests hikers head to the falls early in the season of they want to see Whitney Falls, presumably because of the author assumed water would be in Whitney Creek during the spring thaw. Sadly, this is poor advice, since it is likely to lead hikers to a dry chasm and no waterfall. While one might think that the thaw would produce enough water to swell Whitney Creek, in truth it is the later-summer melting of the Whitney Glacier that supplies the water that pours over Whitney Falls. Consequently, plan on hiking this trail in the afternoon in late July or August. The rule of thumb is not to make the trip if no water is flowing in Whitney Creek when it crosses under Highway 97. If there is a good flow at that point then hikers can be assured that there will be some water going over Whitney Falls. If this is the case, then make the journey to the falls. It is a beautiful spot with a beautiful waterfall and amazing views to the north and west and a memorable place to relax on a summer evening. Though I don’t keep constant tabs on the flow in Whitney Creek, I do pay attention when I pass over it on Highway 97. If someone is interested in making the hike to the falls, feel free to shoot me an email and I will let you know if I am aware of water in Whitney Creek. Was wanting to do the Whitney falls Hike this weekend. Do you know if it is flowing? Hi Shelby. I haven’t been out there for a little while so I am not sure if it is running or not right now. However, Whitney Creek usually does not flow all the way down to Hwy 97 until late June. The exception to that is if things get really hot earlier than normal. The creek runs on glacial melt from the Whitney and Bolam Glaciers.